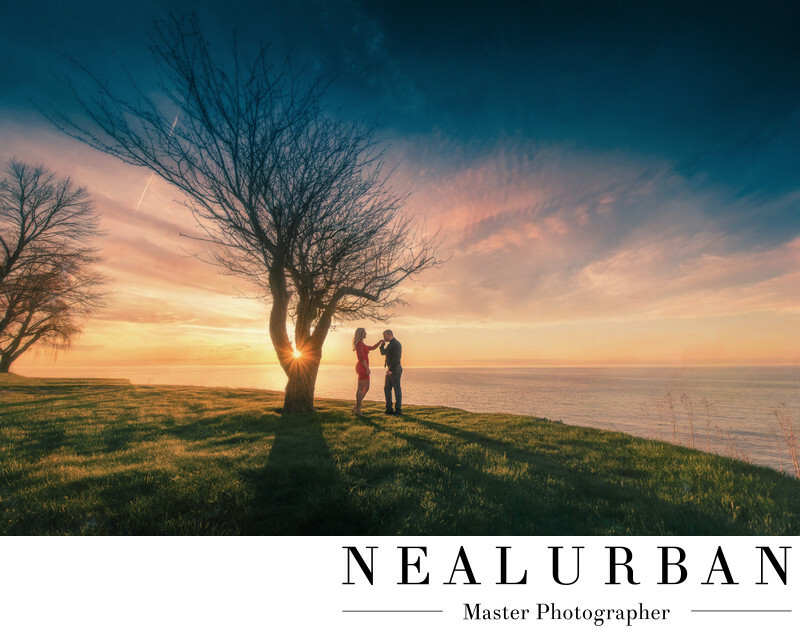 Nina and Greg had an amazing sunset for their engagement session. We started it off near the Wilson Boat House in Wilson, NY. Then we headed over to Nina's parents house around the corner to take advantage of their property. Then we went down the road to the Daisy Barn Camp ground. This image was on the camp grounds. This tree was so neat. It was all alone near the water. The sun was sinking fast and the colors in the sky looked beautiful. We loved the dark clouds and the vibrant colors on the horizon.There are always great colors when there are some clouds in the sky. We had Nina and her fiance Greg walk toward the edge of the water. We wanted to get a shot with the entire tree and the amazing back drop. We had Greg take Nina's hand and pull it in for a kiss. Neal Urban wanted something a bit more artistic to match the scene. This image looks like the couple should have been in silhouette. We decided we didn't want that. So, we added some light on the front of them. We really liked Nina's red dress and wanted some of that color to show! When there are sunsets like this, they do not last long. We have to work fast before the sun is gone. We always tell our clients that we may need to hustle to get the best sunset and location. They are always up for the challenge! This bride and groom had their ceremony at St. Louis RC Church in Buffalo. Then we went to City Hall for photos. The reception was at the Statler. They had cocktail hour in the Terrace Room and the reception in the Golden Ballroom! Location: 3101 W Lake Rd, Wilson, NY 14172 .